Does E3 still matter? Yes, yes it does. This week on Kotaku Splitscreen, let’s discuss why. First, Kirk and I break down the news of the week on Fallout going online, new Pokémon, and Valve removing a school shooting game from Steam. Then we open up the mailbag for a whole bunch of pre-E3 questions about the show’s importance, what games we’re most worried about, the merits of video game storytelling, and much more. My question might be too basic for the show but I’ll ask it anyway. 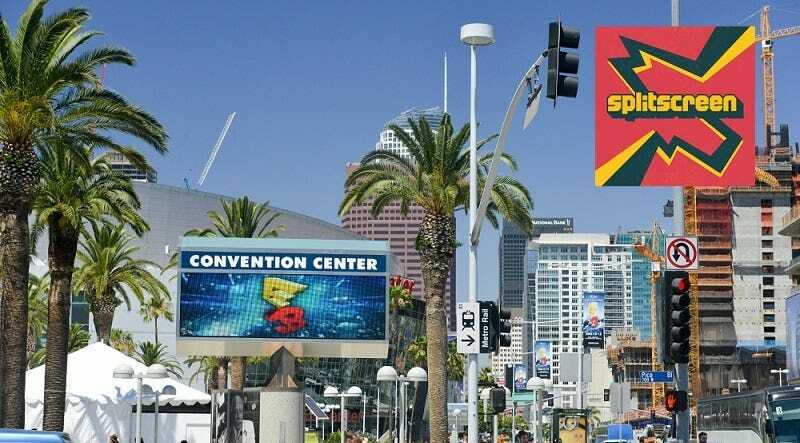 Is E3 important for the gaming industry? What purpose does it actually serve? Obviously it generates hype for games but with as much gaming coverage as there is now does it make much of a difference compared to games that aren’t announced at E3? Ps. I really loved the secret hunters of destiny episode you did and I’m looking forward to what you guys try next! So there are all kinds of meetings like that that happen at E3. It’s also the only time when a lot of international people might be in town, publishers and developers and executives, so they’ll be taking plenty of meetings. There’s a lot going on that we don’t see—the shadow side of E3. As for the actual parts we see, the press conferences and demos and trailers, I think it’s still pretty important. I think it still gives the video game industry this feeling of this annual Mecca, even though things have changed over the years and nowadays there’a stream of announcements all year long, there’s still something essential about it. If you’re a small developer and you get picked to show your game in a sizzle reel at Sony’s conference, that’s the biggest deal in the world—that will get you so many eyeballs. Or if you make a big splash at E3, that might change the course of your game forever. So I do think it’s important - what do you think? Kirk: I’m more weary of and skeptical of E3 in general — I don’t have a lot of use for it, even though it’s fun professionally just to have a whole lot happening, and to get to work a lot and write a lot and have a lot of people reading the site. Basically, E3 is a marketing event, and it’s a total marketing event that combines aspects of a press event with aspect of a business event. Taken as a total, it’s still absolutely useful for all these companies that I don’t really care about, retailers making deals that we don’t really cover and is not really my thing. As a press event, it’s fading in relevance. That doesn’t mean much for E3 because it’s so relevant in all those other ways. The question of, does it make much of a difference compared to games that aren’t announced at E3? Sometimes that’s true, sometimes it’s not. Rockstar can do whatever they want, announce games whenever they want. Bethesda can do whatever they want, announce a new Fallout whenever they want. There are also indie developers who announce games, and the game sounds good enough or the developer has a good enough track record that it’s exciting even if it’s not announced at E3. And there are outlets like Geoff Keighley’s Game Awards. Jason: Well that’s the E3 of December! Kirk: But I mean, there are other press events that are made for doing that, and the Game Awards don’t double as a marketing and publishers event in the way E3 does. So I see fading relevance on the press front, but given how important is it on those other aspects, I don’t think it’s going anywhere. We’re gonna continue to see more and more news and announcements throughout the year happening outside of E3, though. Jason: Yeah, we already saw with Sony, they tempered expectations and essentially said, ‘Hey, we have these four first-party games: Last of Us II, Ghost of Tsushima, Spider-Man, Death Stranding, and we’re not gonna announce any others.’ That may be true, that might be a lie, but they’ve said you shouldn’t expect any other megatons. For much more, listen to the full podcast. As always, you can find Splitscreen on Apple Podcasts and Google Play. Leave us a review if you like what you hear, and reach us at splitscreen@kotaku.com with any and all questions, requests, and suggestions.